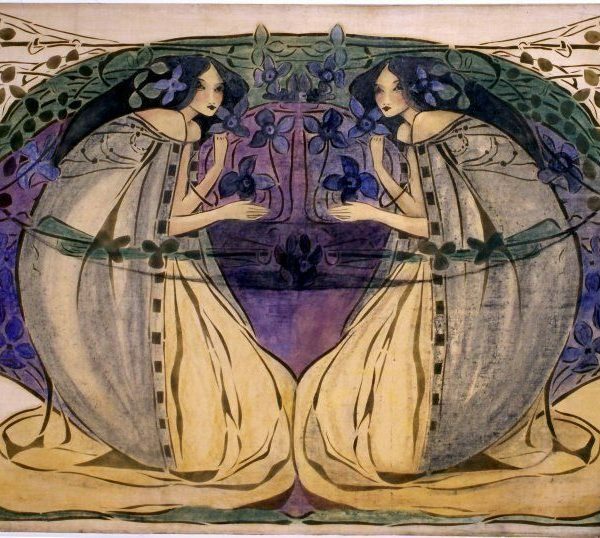 Warwick Goble was born on 22 November 1862 in Dalston, North London. The son of a commercial traveler, Goble studied first at the City of London School and then at the Westminster School of Art. During this time he worked at a printing company specializing in chromolithography and illustrated sections of the Westminster Gazette and the Pall Mall Gazette. Goble began contributing half-tone illustrations to various magazines in 1890, including The Boy’s Own Paper, Strand Magazine, and Pearson’s Magazine. 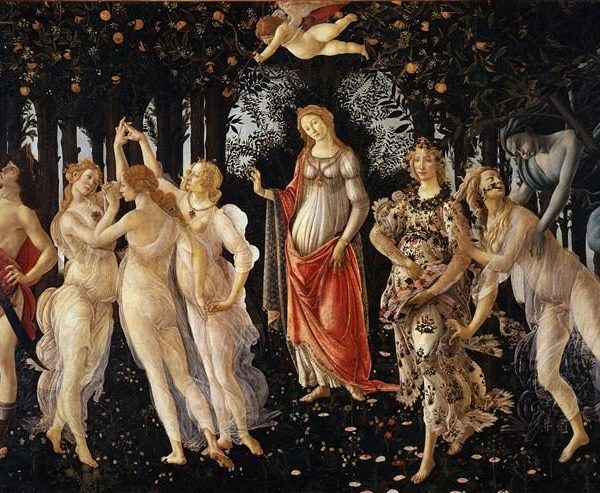 A few years later he started exhibiting his extraordinary work at the Royal Academy. His beautiful watercolor illustrations were well suited to the new books of the early twentieth century, and in 1896 Goble began illustrating books with The Oracle of Baal. In 1897 he provided illustrations for the serial of H. G. Wells’ The War of The Worlds in Pearson’s Magazine and, a year later, became the first person to illustrate Wells’ masterpiece in its novel form. Following this Goble continued to contribute illustrations to a number of scientific romance works for a short time. Thanks to books such as Rip Van Winkle (1907) and Arabian Nights (1907), fantasy books containing color plates became incredibly popular. 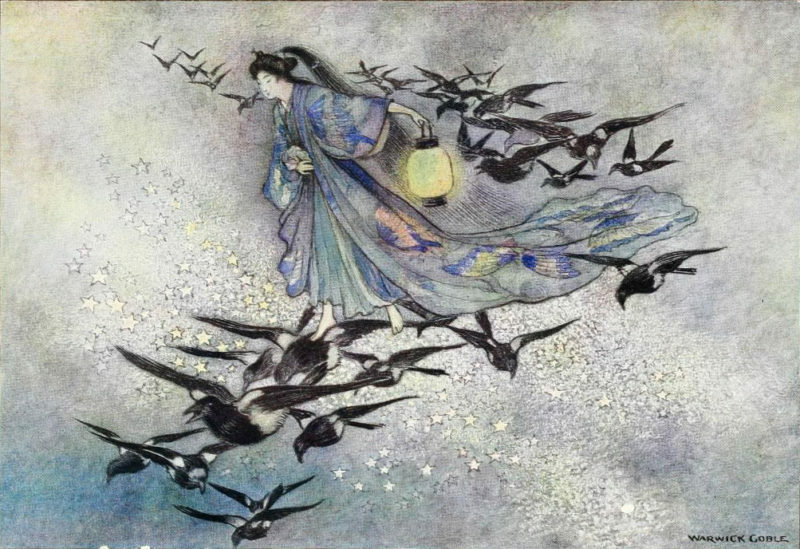 Arguably taking inspiration from Edmund Dulac‘s Japanese style and already an accomplished watercolor artist, Goble was well positioned to take up the mantle in a market that increasingly demanded color-plate books. He took to the task readily, producing more books in the period between 1909 and 1913 than he had done in the entirety of his career previously. He became the resident illustrator of gift books for MacMillan in 1909, where he illustrated The Water Babies (1909) Green Willow and Other Japanese Fairy Tales (1910) and which were amongst the most elaborately illustrated volumes of the time. Although the influence of Dulac existed in these works, it was clear that Goble was beginning to foster his own unique style at this point. In 1911 Stories From the Pentamerone was published and The Fairy Book – The Best Popular Fairy Stories in 1913, each containing 32 unique color plates. Stories From the Pentamerone was a beautiful example of Goble’s Japanese techniques and was one of many which would come to solidify his reputation as a master illustrator of Asian storybooks. Folk Tales of Bengal (1912), Indian Myth and Legend (1913), and Indian Tales of the Great ones (1916) were subsequent titles that fell into a similar category. Although in a slightly different vein, Chaucer (1912) was another notable example of Goble’s marvelous illustrative proficiency. The arrival of the First World War saw him working in Woolwich Arsenal’s drawing office, and he took a complete hiatus from illustrating at one point to volunteer for the Red Cross in France. After the war he continued with his work, illustrating The Cistercians in Yorkshire in 1919 and The Book of Fairy Poetry in the following year. He did occasional work for New York MacMillan and produced some of his most famous illustrations for Robert Louis Stevenson‘s Treasure Island (1923) and Kidnapped (1925). His last contributions adorned the pages of Washington Irving’s Tales of the Alhambra (1926) and Elinor Whitne’s Tod of the Fens (1928), after which Goble relinquished illustration and turned his attention to cycling, sculling, and traveling. He died on 22 January 1943 in his Surrey home. Take a minute to create your account on the site right here. I recommend using your full name or business name as your username. 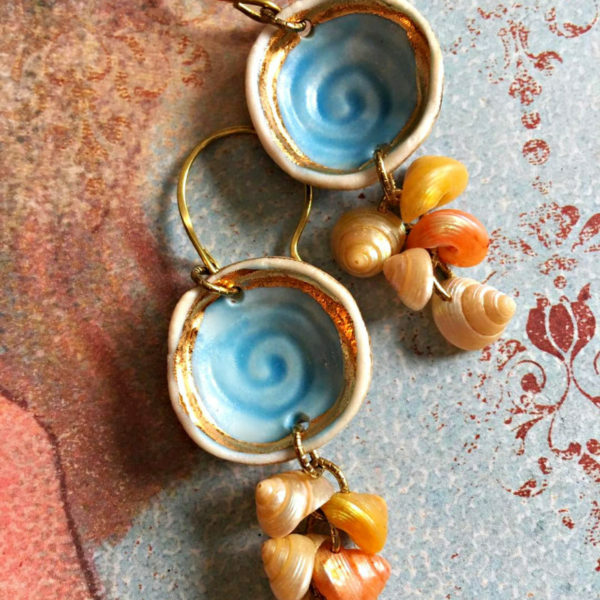 Create something using an art bead that fits within our monthly theme. We post the art to be used as your inspiration to create. This challenge is open to jewelry-makers, fiber artists, collage artist, etc. The art bead can be created by you or someone else. The challenge is to inspire those who use art beads and to see all the different ways art beads can be incorporated into your handiwork.An Art Bead must be used in your piece to qualify for the monthly challenge. Upload your photo to our new photo gallery. Include a short description, who created the art beads and a link to your blog or shop, if you have one. Deadline is February 28th. One entry will be picked by the editors each month for a free month of advertising on the Art Bead Scene. Bead entries have to be uploaded to the photo gallery by the 30th of the month. See above to create an account. • Two prize winner will be selected at random from all pictures posted in our new gallery! • Winners will be randomly chosen from all the qualifying entries on January 1st. • Perfect Pairings focus on both the jewelry designer and the art bead artist. • From all the entries during the month, an editor will pick their favorite design to be featured on Friday here on the ABS, so get those entries in soon. An art bead is a bead, charm, button or finding made by an independent artist. Art beads are the vision and handiwork of an individual artist. You can read more about art beads here. ***A bead that is handmade is not necessarily an art bead. Hill Tribe Silver, Kazuri ceramic beads or lampwork beads made in factories are examples of handmade beads that are not considered art beads. Join us Tomorrow to see our prizes and sponsors for January! Wow, wow!! Do I love this!!!!!!! Challenge indeed!! !